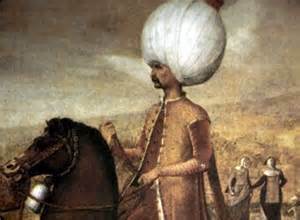 Suleiman the Magnificent (1494-1566) - Suleiman is considered the greatest sultan of the Ottoman Empire (even more so than his great-grandfather, Mehmed II; although it's close). Under his reign, the empire reached its maximum extent. And at almost 46 years, between 1520 and 1566, it was the longest reign in Ottoman history as well. The first decade of his rule was characterized by expansion and war. He was an able military commander, leading his troops personally on the battlefield in 13 campaigns (he was thought to be a great admirer of Alexander the Great). Many of the details of these campaigns are recorded by Suleiman himself. A year after he became sultan, he took Belgrade, something Mehmed failed to do. The following year, in 1522, he captured the island of Rhodes, which had been held by the Knights Hospitaller since the Crusades. The strategy for taking Rhodes involved building a fortress, Marmaris Castle, on the coast of Asia Minor directly across from the island. From there, he launched a fleet which overwhelmed the island's defenses after a five month siege. Suleiman inherited a powerful navy from his father, Selim I. But he made it even stronger and it came to dominate the Mediterranean and Red Seas, as well as the Persian Gulf. After Rhodes, he returned to Europe. Much of his gains came at the expense of Hungary. In 1526, he won the Battle of Mohács at which King Louis II was killed. This brought him right up to the border of the Holy Roman Empire and contact with Emperor Charles V (also known as Charles I, King of Spain). They were two of the most powerful men in the world at the time. They met at Vienna in 1529 and Suleiman was defeated. His expansion in Europe ended at that point. So he turned east and fought the young Safavid dynasty of Persia. In 1534, he acquired Mesopotamia, and made the Zagros Mountains his border with that kingdom. But Suleiman was not just about war. In his later reign he promoted arts and culture within his empire. After a great earthquake in 1509, the Topkapi Palace was badly damaged. Suleiman had it rebuilt to even greater splendor than its original construction. He ruled during at pinnacle of Ottoman power and his reign is remembered as the "Golden Age" of the empire.